Police have discovered another 28 bodies at the site in southern Sri Lanka of what is believed to be the world's worst train disaster. 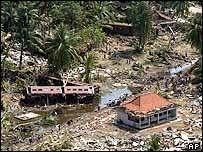 More than 800 bodies have now been identified but it is feared twice that number may have died when the Indian Ocean tsunami hit the train. Hundreds of villagers had clambered on to the Queen of the Sea to try to flee the tsunami when fresh waves struck. 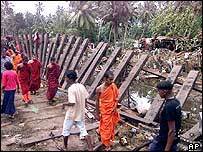 Nearly 31,000 Sri Lankans died in the tsunami with one million displaced. Work at the train disaster site at Telwatta, 75 miles (110km) south of the capital, Colombo, continues to yield victims. "We found the decomposed bodies of 28 people over the weekend," the southern region police chief, DW Prathapasinghe, told AFP news agency. "This search operation will be continued," he said. Police say a week ago another 29 bodies were found but identification was not possible because of the advanced stage of decomposition. They say that the bodies have been located in different places close to where the Queen of the Sea was swept of the rails on 26 December. More than 1,500 people had crammed into the train as it travelled to the southern city of Galle. The force of the tsunami threw the train's eight cars into a bog and left the coastal railroad a twisted mess of metal. The disaster at Telwatta is believed to be the world's worst train crash. In the Indian state of Bihar in June 1981, 800 people were killed when a train was blown into a river during a cyclone.